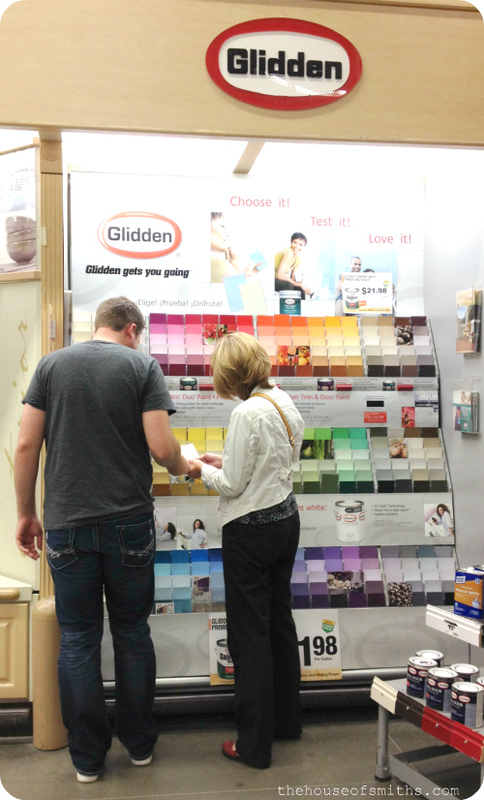 A few days ago I went with Cason and his Mom to pick out a bunch of paint swatches for her new house. 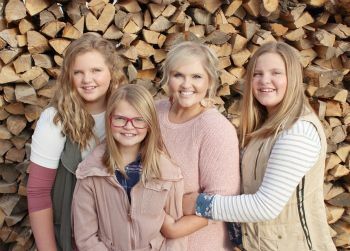 Cason's parents had been living in the same home for over 13 years, and after they raised all 6 of their kids and served a mission in Africa, they decided that it was time for a change... so they bought the loveliest home up on the mountain, with a killer view, not too far from where they lived before. Something that isn't Cason's parents favorite though, are the paint colors. For them, it's just a little too dark and mustardy, so they're looking to lighten everything up a bit. Initially I was thinking Glidden's Autumn Haze (of course), mostly because it's what we have throughout our entire home, and also because it's been my favorite go-to neutral paint color for the past 3 years; but we also snagged a few other options that we wanted to try out too. I don't know if you've seen the new My Colortopia, "Show Me How" videos from Glidden yet, that Lindsay from Makely Home has done, but I took a few cues from there, to help my in-laws narrow down their color choices. We even went a bit further, with one of my favorite tactics, and painted a few samples of each color that they liked on the wall, for them to live with for a few days to see how they liked them in natural AND artificial (incandescent or sometimes fluorescent) lighting. 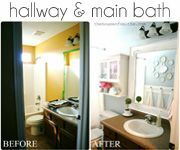 I think this is SUPER important, because it's the only REAL way that you're going to be able to know if you LOVE the paint color at all sorts of angles and under totally different lighting situations. It's amazing what natural light and warm, artificial light will do to the same exact paint color. I think Cason's parents are leaning more towards the warmth that Autumn Haze has to offer (the right paint swatch), but Cappuccino White is a close runner up. Since those two colors were painted right next to each other, we stood a pure white barstool next to them and even leaned up a few different colored pillows on it, to test out what it did to the paint (if it brought out more grays, greens, yellows, etc...). I'm totally aware that it's hard to tell the difference here, due to the lighting and probably color variation on everyone's individual computer monitor, but to be honest, it's super tough in REAL life too! It may not translate this way, but those walls right now are a deep shade of super, overly warm yellow... so everything (especially in a photo) tends to look like it's hinting on the gray side. Next week Cason's Mom and I are going to start looking at some couch color swatches, so we can get a large sectional for this room, and then we'll really be able to nail down a paint color after that. Since we want the walls and couch to be the more neutral things in this space and complement each other well, we feel that if we do THAT part correctly, no matter what color we use for our accents, the walls and couch will always look great in this area. I've said it once, and I'll say it again... 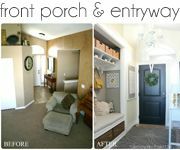 If you have neutral bases, you can add, take away or change-up colors in your decor anytime you want, and you'll never feel like you're locked into one specific color scheme. PLUS, it gives you the freedom to do a lot more style mixing. This option will be exceptionally perfect for Cason's Mom, who still isn't quite sure what exactly she wants for this space. I'm seriously so excited to go on this adventure with Chris and Steve, as they start nesting into their new place. There's nothing better than making a house feel like a home, right!? 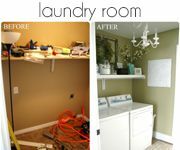 We'll be keeping all of you tuned in from time to time on updates in their space that we help them with, so that you can see the transformation too. Till next time!... This post was sponsored by Glidden Paint. Regardless, I only post about products or companies I love. All ideas and opinions are 100% my own. Love the neutral paint colors and those high ceilings! I'm curious to see how you decorate those extremely high walls since they have become very popular in newer construction! ooooh I really like Cappuccino white! I am going to have to check that paint swatch out for my own home! Looking forward to following the transformation of that beautiful space. So I told my husband the same thing, that you need to actually paint a swatch to see if you really like it. So I painted two swatches on our bedroom wall to decide. That was 10 months ago. I realized right after I painted them that our newborn son was still rooming with us and I should wait until we could move him in with his sister (i.e, when he starts sleeping through the night). Again, that was 10 months ago. Sigh...I had good intentions at least. Shelley! Where was this post last week! 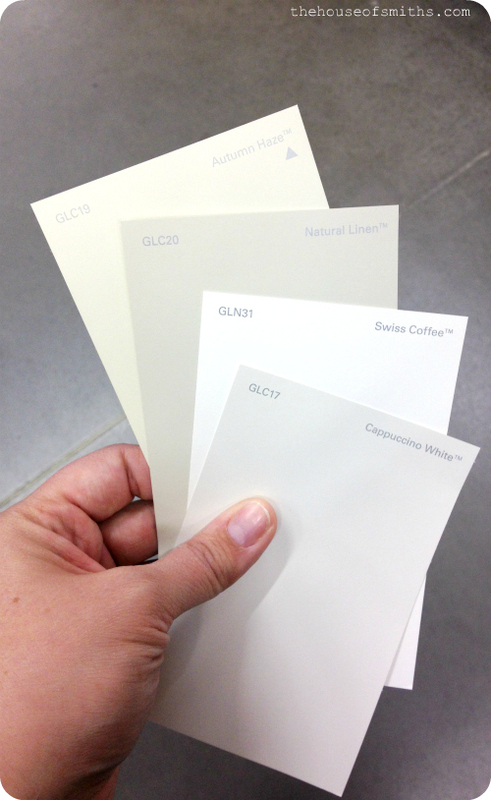 We just had the daunting task of picking out a color for our new home. We ended up with Gliddens Natural Wicker. 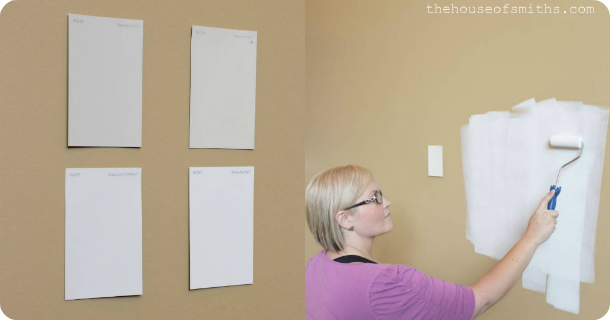 I did the same thing with 3 different paints samples on the wall but still found it scary to make the big decision. Now that it's all done...we are loving it. ;) I don't want to touch a paint brush for a LONG time! Good luck! Sounds fun! What a great space! Those high ceilings are awesome! 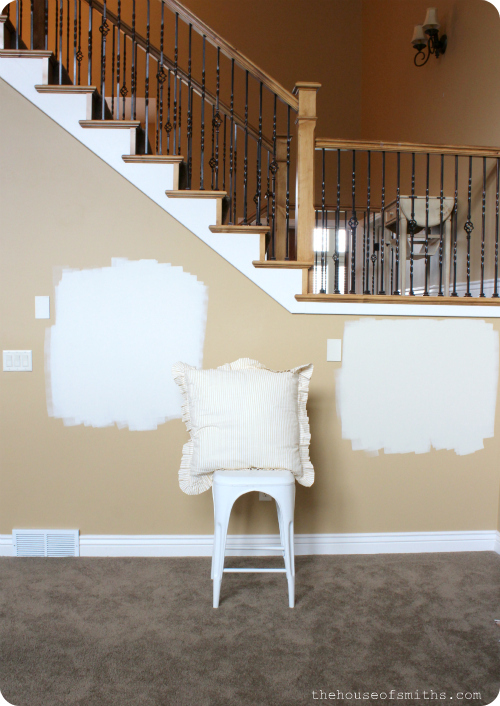 Choosing paint colors is always such a daunting task, but I love these tips for making it easier! Hope you're having a wonderful weekend, Shelley! Any paint color would look great in that amazing house! 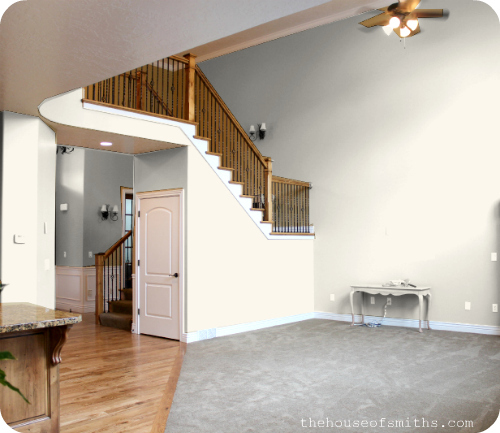 I LOVE the way the stairs are open to below and the huge ceilings! So beautiful! So SUPER helpful!! We are getting ready to paint and I've bookmarked this entry and read and re-read it! 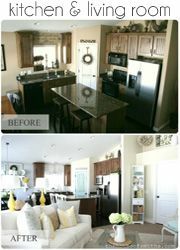 I love your planked wall in your dining/kitchen. What color of paint is it? 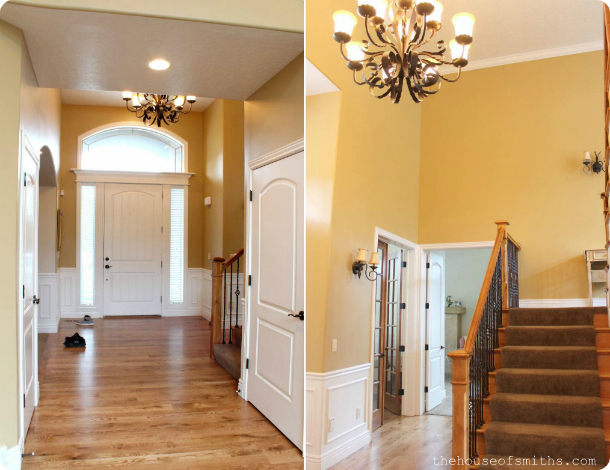 What color do you use for your ceilings? Trim? I just love the way you work!